The world of credentialing is evolving. Degrees have long been considered the basic unit of educational currency. But it appears that we’re experiencing an accelerating shift away from the gold standard of degrees and toward a more inclusive credentialing world that embraces badges, microcredentials and nanodegrees and is based on a market-driven floating exchange rate. For the last decade we’ve lived through increasing degree inflation, watching jobs that previously required only a high school diploma become jobs that require not just an Associate’s degree but a Bachelor’s degree. In extreme forms of degree inflation some of those same jobs now require a Master’s degree or a Doctorate, or even post-doctoral work. What has happened to make this necessary? Have jobs changed that much in the intervening years? Is the world exponentially more complex? Could it be the degree itself causing these problems? My response to that last question is yes. Our dependence on degrees as the primary means by which we collectively judge what someone knows and can do has effectively turned degrees into social and cultural shorthand. An unfortunate and increasingly inaccurate shorthand. An interpretive shorthand that attempts to speak to an individual’s qualifications well beyond what formal education currently provides, and one that gives informational short shrift to all stakeholders, perhaps most disappointingly, to the learners themselves. Why must the degree be so opaque? What does a transcript tell the student of their accomplishments other than the grades they received in a prescribed pathway? How does a course grade correlate to an amorphous future job? Is an A equal to a Job Grade Level V review? Brand recognition should not be the calling card that gets most people in the workplace or college door. But it is. Ultimately, that’s primarily what our credentialing system has reified: brand. And not the brand value of the exiting learner—no, that would most likely be an incredibly useful metric. Instead the shorthand / reification focuses on the brand of the credential-issuing institution. Thankfully we’ve begun to see a questioning of this confused metric from both industry (EY + Penguin Random House as noted in Cracking the Credentialing Club) and through calls for research into college and university success rates in the somewhat de-fanged College Scorecard. These credential tremors are indicative of a larger and maybe-not-impending-but-already-happening tectonic shift occurring in education, learning, credentialing, and assessment. I suggest that there is an implicit choice currently available to the credentialing world: evolve or die. You’ll note that this is the same choice that confronts every living thing and it affects both the small no-name brand and the very large, multinational brand. Academic and business systems are living things and must evolve in order to stay useful and relevant. The popular and useful thing of yesteryear may fade quickly into obscurity—and you don’t want to be the flightless bird in this story. Consequently, we need to ask what we think we’re expressing when we hand out degrees and certificates. What is missing? What opportunities do new credentials like open badges offer? What are we hoping to effect and why? These questions must always acknowledge that context and audience are essential components of any answer. Because the credentialing environment is not composed solely of monolithic, faceless institutions struggling to survive, but rather thoughtful, circumspect individuals making hard choices about the potential, cost, and value of credentials in their own personal evolution. This entry was posted in credentials, Open Badges, value and tagged degrees, education, learning, system design on March 1, 2016 by carlacasilli. There are a lot of people who think that our educational system is broken. I tend to think of it as problematic rather than broken—because it still works for some people, just not everyone. Wouldn’t it be great to have a system that works for more people in new ways? Here’s how we may have arrived in this confusing spot regarding education, a spot that is overripe for reimagining. The web. The web is limitless. And its limitlessness has revealed to us the profound limits bound into earlier systems of knowledge measurement. Let’s use an example. Books were a previous primary yardstick. And we thought that all of them gathered together in the form of libraries constituted a window onto the edge of knowledge. a large part of the information found on it is entirely free. Thanks to a lot of people who recognized the value of the web (and who like teaching and tinkering and sharing) learning can now happen and is now happening anywhere and everywhere. So, how can we break free from the limited thinking that chains us to book learning and formal academic levels? Can there be alternative methods of information dissemination? Let’s agree on this: learning is a process. There is no endpoint. But what does this mean for education? That there is no cap to the amount of knowledge we can accumulate. And now because there is no endpoint, we need to rethink how people might find their way through this glut of information. We need something to fill in the space of what was there previously—or at the very least to find a way to acknowledge the new learning spaces that we’re beginning to see. The last printed Encyclopedia Brittanica was published in 2010. It’s now 2013. The world has not stopped amassing information in that interim. So, we must become comfortable with the idea that there are volumes of knowledge that we’ll never know. It’s simply not possible to do that anymore; it’s not possible to put edges or boundaries on learning opportunities. 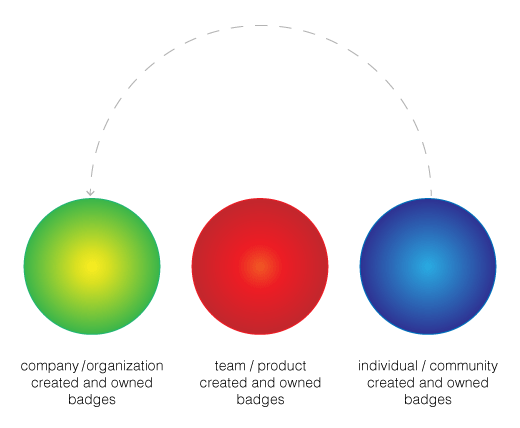 This is where badges can provide their greatest value: as guideposts in an increasingly complex knowledge universe. Badges can be issued on an atomic level. We can start to acknowledge the primary elements that constitute a basic level of knowledge. I’m hesitant to even use the word level here. Due to its requirement for contextual definition, the idea of educational levels often leads straight to a bizarro world where levels are spoken about as if they’re universal, but their implementation reveals that they are most distinctly not universal in application. Let’s just say that there are continua of knowledge and as a whole we are on them. To quote my colleague, Doug Belshaw, from our in-progress web literacies* white paper, “Literacy is a condition to be obtained not a threshold to cross.” The key to that statement centers on the idea of conditions: we are continually moving through and across boundaries of knowledge. This is one of the beauties of the web—and of life. In general, the boundaries we experience have been created and defined by us in the development of our society. 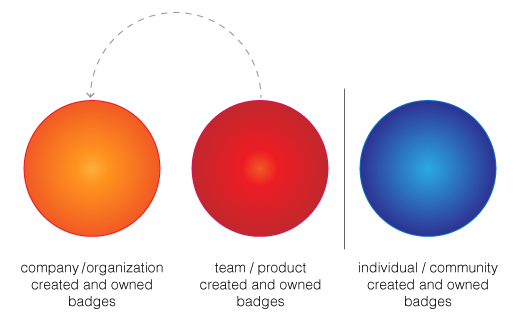 Badges let us reimagine what those boundaries are and where they might appear. Thus, we can move ever closer to aligning our ability to acknowledge all of the learning now possible with the web’s vast capacity for increased knowledge acquisition. Right now we’re focusing on what a web literacy standard might look like and how it might be implemented. A significant portion of this thinking will include developing potential learning pathways. Along those lines, we will be thinking through the framework’s ‘Beginner’ and ‘Intermediate’ levels before considering ‘Pre-Beginner’ and ‘Advanced’. Taking this approach will allow us to produce multiple touchpoints and signposts along the way to web literacy. We’ll use those touchpoints and signposts to develop a web literacy badge system that accommodates various learning pathways, builds upon the web literacy framework, encourages continued community badge creation and aligns with Mozilla’s Open Badges Infrastructure. Join our weekly web literacy standard community call on Thursdays 8am PST / 11am EST / 4pm GMT. Here’s a canonical etherpad agenda that includes dial in information. Visit our continually updated wiki. Continue to read and respond to these posts. Share your ideas about what might be useful indications of learning. 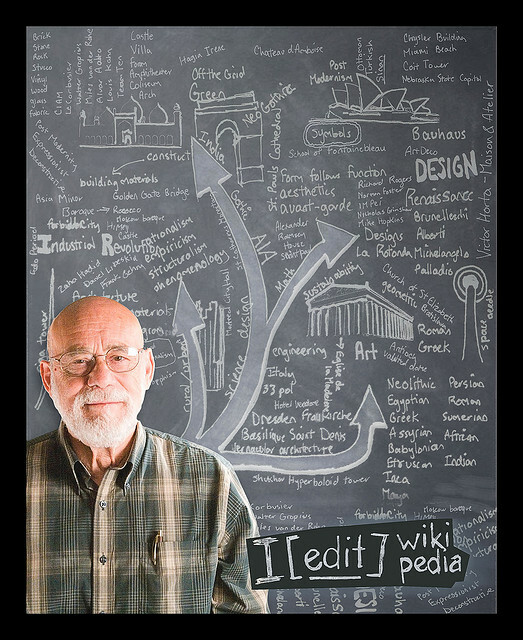 Begin to imagine a world where web literacy is an easily understood literacy with badges that communicate where someone might be on that arc. We’re gathering together with you at the forefront of our understanding of what web literacy is and we’re aiming to map out a workable future. We’re pretty excited and we’re really glad you’re here. * It’s worth noting that we’re distinguishing between our earlier work with web literacies and our new efforts for a web literacy learning standard. This entry was posted in Badge System Design, Definition of Terms, General, Mozilla Learning, OBI, web literacies, web literacy badges, web literacy standard, webmaker and tagged community, learning, literacy, mozilla, networks, OBI, open source, software, system design, web literacies, web literacy standard, webmaker on February 27, 2013 by carlacasilli. Badge system design can be considered in a variety of ways. I tried to come up with thirteen ways to discuss them so I could write a poem riffing on one of my favorite poems, Thirteen Ways of Looking at a Blackbird (Thirteen Ways of Looking at a Badge System) but I’ve had to settle for seven eight (see addendum below). Below you’ll find the seven different possible categorizations listed with a few representations of each type of thinking. This is not an exhaustive list by any means: it’s simply an opportunity to unpack our influences and perceptions as we begin the process of designing badge systems. The methods outlined below include philosophical, conceptual, pedagogical, visual (aesthetic), technical, categorical, and ownership. The last one, ownership, feels a bit odd because it’s not quite parallel to the rest of the bunch. I like a system that has a nice balance and this one has a slight imbalance. Happily, this slightly odd fit serves to emphasize the importance of allowing for an outlier. The outlier will cause you to reconsider your system every time—and that’s a good thing. The outlier is the thing that keeps your badge system honest, keeps it moving and evolving. Because if you’re designing a system so as to keep everyone within a certain range, you’re trying too hard. And you’re deep in the midst of a lush forest. In any case, I’m curious to hear your reaction to these potential sorting efforts. No doubt these groupings can intermixed and most certainly they can be layered, possibly interleaved with one another. Are there additional ways to consider the design of badge systems? Do any of these seem innate? Far-fetched? What do we gain by sorting through systems in this way? I continue working on questions like these and look for your feedback (which, according to Donella Meadows, is a good way to ensure that your system is running smoothly). Still, I have to try it. May 23, 2012 addendum: Recent thinking points to the fact that these categories exclude content. So now there are 8 ways to sort through badge system design. Some possible representations of that categorization include: language choice; content-driven vs. context-driven; formal vs. informal; system vs. one-off; single language vs. multiple languages; alliterative vs. rhyming vs. allusion-based, etc. This entry was posted in Badge System Design, OBI, Open Badges and tagged badge system design, creativity, design, drumbeat, inspiration, learning, mozilla, openbadges, system design on May 20, 2012 by carlacasilli. What do we mean by literacy? Traditional literacy lifts people out of poverty, modifies their worldviews, opens up new vistas and provides new opportunities for further enrichment, whether they be social, political, professional, or ideological. If you want your own proof, just search with this combination of terms “literacy and poverty.” Who’s to say that digital literacy won’t accomplish similar things? In the vein of the scientific method, why not test it out? Literacy itself is a complex term that encompasses a broad spectrum. In our case, literacy is a basic communication skill, akin to numeracy or traditional language literacy. We’re not aiming to make everyone into Joycean code experimenters pushing the boundaries of language and comprehension, nor are we aiming to move everyone toward Hemingway-esque brevity and conciseness, but if some of you decide those pathways are for you, all the better. At least you’ll be moving forward with a broader understanding of what’s possible. And you will be making the decision for yourself, not having it handed to you by some faceless mega-corporation. Our initial take on web literacy skills is bouncing along as an ongoing experiment (sounds familiar, right?). In the same vein as iterate often, we’re out there trying things on, seeing what feels right. Working with other organizations to leverage their understandings of web literacy and expand upon our own. What we’re interested in doing with webmaking is shining a light into a place you may not have considered looking before. Showing you that that place is not full of monsters, is not incomprehensible, but is instead simply the exact same world you’ve been experiencing all along just translated into another language. Learning to code is a deciphering of sorts—a decoding of symbols. It offers a different lens through which to view the world. This new knowledge lens may significantly alter the way you perceive the world; it’s hard to say how it will affect you. Perhaps that unknown quantity is precisely why Mozilla believes learning to code is something everyone should be afforded the opportunity to learn how to do. The operative word in that sentence is opportunity. This entry was posted in Mozilla Learning, Open Badges, open education and tagged drumbeat, identity, inspiration, learning, literacy, mozilla, politics, social networks, software, system design, tools, webmaker, webmaking on May 15, 2012 by carlacasilli. 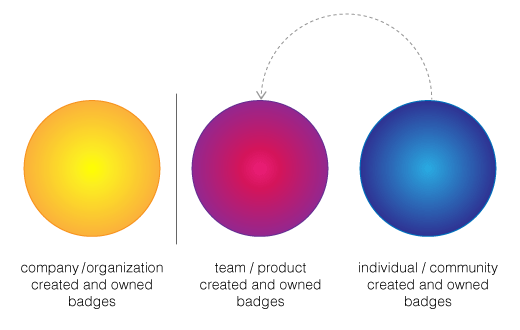 We’ve leapt into Badge System Design in some earlier posts (1, 2, 3) and we’ll be returning to it shortly, In the interim, I’d like to step back to consider a small number of basic Open Badges tenets. In this edition, we’ll address our evolving lexicon and in particular the nomenclature of Earners and Issuers. In addition to their ability to transcend physical boundaries, badges introduce many potential languages, e.g., visual, verbal, cultural, pedagogical, etc. Badges will activate these languages, sometimes one at a time, sometimes all at once. Each of these languages may speak to different audiences, and often to many audiences at once. As simple as we try to make our badges, they will be deeply influenced by our worldviews: imbued with our community’s understandings, desires, and values—and those will be intertwined with the earner’s understandings, desires, and values. In turn, those perceptual strands will be woven through the general public’s social assumptions and cultural fibers. Teasing out a strand (or badge) will not reveal the germ of the process but it may help point toward some of what has influenced it. In short, badges can stand alone, but will remain bound into a complex sociocultural system. Consequently, flexibility in our system design is key. As we attempt to build and rationalize an open badges lexicon, we recognize that a need for individuation, modification, or personalization will always exist. This is built into the OBI system. By designing an extremely flexible product, we’ve accommodated many different potentials. Along these lines, we began a document for people to share their ideas about Open Badges definitions of terms. In a nice turn of events, this open approach has lead to some fascinating questions about intent and prescriptiveness. Some questions raised in that document have yet to be answered: it’s an ongoing discussion, one that requires back and forth, give and take. We anticipate that it will continue to raise questions, too. And we’re excited about these provocations because they’ll help us to better understand the ecosystem and improve upon our Open Badges system. A bit of background: we started with “learner” and ended up at “earner.” Believe it or not, dropping the initial consonant involved quite a bit of in-depth thought. We wended our way around to that term after close consideration of the people who might come into possession of a badge. Even the term “earner” presents some weaknesses. Badges can be used to show affiliation, skills, competencies, associations, etc. 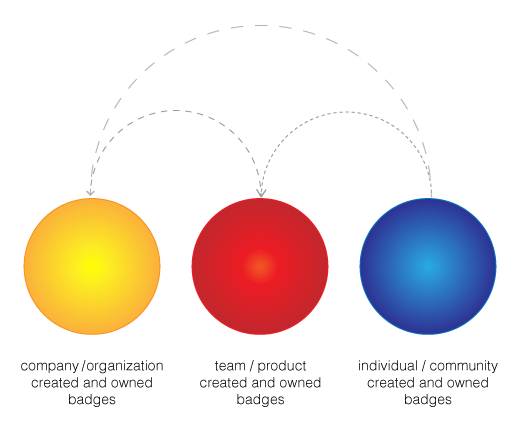 Some of the folks we’ve spoken with have suggested that badges can and should be earned by organizations themselves. In point of fact, we don’t know all the ways badges can be used, yet. That’s the beauty of a flexible system. We chose earner for fairly prescriptive reasons: because we’d like to suggest that badges must be earned, not simply received. However, as badge meaning is initially defined by the issuer, this moniker may change. The earner can be referred to in the way that makes sense to your group. It’s worth remembering, though, that your earner/holder/recipient/whatever will be interacting in a broad ecosystem along with many Issuers, Displayers & other earner/holder/recipient/whatevers. They’ll have an opportunity to speak for and about themselves and may choose their own sobriquet. This one is pretty obvious as to why we chose it: these groups, organizations, individuals, institutions, corporations, etc., do the hard work of issuing badges. Not only do they create badges and badge system designs that transmit their values to badge earners, and a variety of additional publics (cf., Michael Warner’s Publics and Counterpublics, much more on this in later posts)—they also build the criteria for those badges, develop badge progressions, create scaffolding opportunities, and undertake the difficult problem of assessment. Plus, they make the commitment to civic participation in the broader Open Badge ecosystem. In a future post I’ll address Mozilla’s approach to privacy, as well as explain our rationale for naming Displayers and Endorsers. Much more soon. This entry was posted in Badge System Design, Definition of Terms, OBI, Open Badges and tagged badge system design, drumbeat, identity, learning, mozilla, OBI, open source, openbadges, privacy, social networks, software, system design on May 8, 2012 by carlacasilli.